Summary: Boosting mitochondria may defend against a form of protein stress that can reduce the formation of amyloid plaques, EPFL researchers report. Taking this line of thought, Johan Auwerx’s lab at EPFL looked at mitochondria, which are the energy-producing powerhouses of cells, and thus central in metabolism. Using worms and mice as models, they discovered that boosting mitochondria defends against a particular form of protein stress, enables them to not only protect themselves, but to also reduce the formation of amyloid plaques. Whole-brain hemisphere sections of Alzheimer’s mice, the model APP/PSEN1, before and after treatment with the NAD+ booster Nicotinamide riboside (NR). 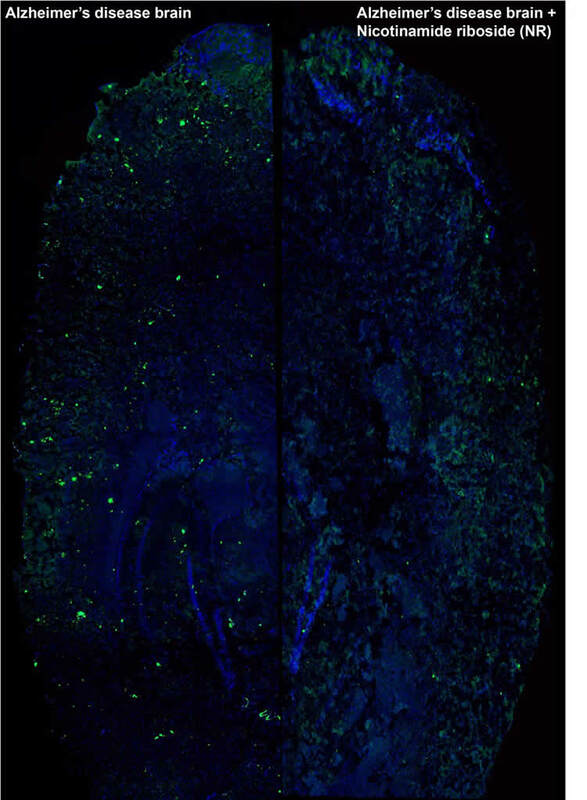 The beta-amyloid plaque content in the brain of the APP/PSEN1 mice (left), clearly visible by Thioflavin S staining in green color and associated to brain damage during the disease, is reduced after 10 weeks treatment with NR (right). NeuroscienceNews.com image is credited to Vincenzo Sorrentino, Mario Romani, Francesca Potenza/EPFL. Researchers from Michigan State Uniersity also participated in this research. Funding: Funding provided by EPFL Fellows’ Program, Associazione Italiana per la Ricerca sul Cancro, National Institutes of Health, Systems X, Velux Stiftung, Jebsen Foundation. Image Source: NeuroscienceNews.com image is credited to Vincenzo Sorrentino, Mario Romani, Francesca Potenza/EPFL. EPFL “Healthy Mitochondria Could Stop Alzheimer’s.” NeuroscienceNews. NeuroscienceNews, 6 December 2017. EPFL “Healthy Mitochondria Could Stop Alzheimer’s.” http://neurosciencenews.com/alzheimers-mitochondria-8123/ (accessed December 6, 2017). Alzheimer’s disease is a common and devastating disease characterized by aggregation of the amyloid-β peptide. However, we know relatively little about the underlying molecular mechanisms or how to treat patients with Alzheimer’s disease. Here we provide bioinformatic and experimental evidence of a conserved mitochondrial stress response signature present in diseases involving amyloid-β proteotoxicity in human, mouse and Caenorhabditis elegans that involves the mitochondrial unfolded protein response and mitophagy pathways. Using a worm model of amyloid-β proteotoxicity, GMC101, we recapitulated mitochondrial features and confirmed that the induction of this mitochondrial stress response was essential for the maintenance of mitochondrial proteostasis and health. Notably, increasing mitochondrial proteostasis by pharmacologically and genetically targeting mitochondrial translation and mitophagy increases the fitness and lifespan of GMC101 worms and reduces amyloid aggregation in cells, worms and in transgenic mouse models of Alzheimer’s disease. Our data support the relevance of enhancing mitochondrial proteostasis to delay amyloid-β proteotoxic diseases, such as Alzheimer’s disease.